More than four years after his parents perished in a car wreck, baby Tiantian was born in Guangzhou in December 2017. 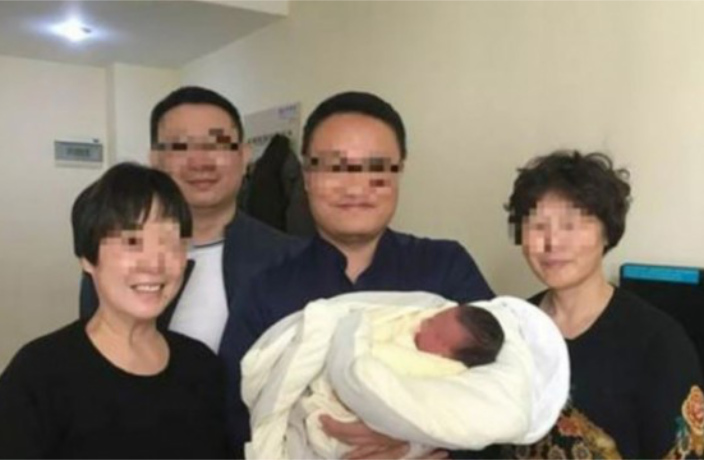 Tiantian’s parents, Shen Jie and Liu Xi, had been married for two years when they decided to try to conceive a child through in vitro fertilization – a process in which extracted eggs and sperm are combined in a lab dish. Unfortunately, less than a week before Shen and Liu were to attempt the procedure, in March 2013, they both died in a motor vehicle accident in Jiangsu province. Over the following three years, the parents of the deceased couple engaged in several precedent-setting legal battles to obtain the frozen embryos left behind by their children. When the wannabe grandparents finally received custody of the embryos, they set out to find a surrogate mother. Surrogacy in China, as in many countries, is illegal in any form. As a result, the four grandparents, with the help of an underground agent, set off to Laos (where there are no laws regulating the practice) to find a woman to carry the child, The Guardian reports. Very few countries in the world allow commercial surrogacy — wherein potential parents pay to have a fertilized embryo gestated in the womb of a woman with no genetic relationship to the baby – and many decry the practice as one vulnerable to human trafficking and exploitation. India, a global hotspot for commercial surrogacy arrangements, has passed laws tightly restricting the ability of foreigners traveling to the country to seek a surrogacy arrangement, a practice known as ‘fertility tourism.’ In 2015, Thailand banned commercial surrogacy on behalf of foreigners outright. Regardless of the legal entanglements, Tiantian’s grandparents managed to get their Laotian surrogate to Guangzhou in time for the birth, after which they were able to demonstate a legal basis for guardianship through a DNA test. Last month, Tiantian celebrated his first 100 days of life. “Tiantian’s eyes look more like my daughter’s,” Beijing News quoted the child’s now-grandmother as saying, “but overall, he looks more like his father. On Sunday afternoon, March 31, a dust devil in Henan province killed two children and injured at least 20 others at a local fair.